The iconic Woodstock brand is New Zealand’s number one bourbon and cola and is the single biggest liquor brand in the traditional liquor channel by value (Aztec Nielsen retails sales data MAT [moving annual total] to February 2014). It is distilled, blended and aged at one of Kentucky’s oldest registered distilleries, deep in the heart of bourbon country. The raw whiskey is aged in new American white oak barrels until it has developed the smoothness and complexity of flavours needed to proudly bear the Woodstock name. It is a brand for the tough working man and takes a tongue-in-cheek approach to all its communications to really hit the mark with the down-to-earth Kiwi guy, using the well-known slogan ‘Crack a Woody’. Woodstock is a full-support brand with above-the-line and high-profile sponsorships, but it also relies heavily on in-store activity in key trading periods to maintain its number one position. 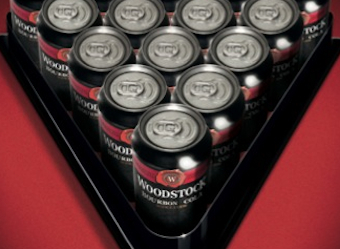 Facing a difficult environment in 2013, with changes to New Zealand’s alcohol regulations and record low beer pricing, Woodstock needed to make an extraordinary impact at Christmas to ensure dominance during this important retail period. Independent Liquor is the leading supplier of ready-to-drink beverages in New Zealand, of which Woodstock Bourbon and Cola is the number one brand. When Independent Liquor approached Below the Line NZ for a campaign strategy, the clear overarching objective was to drive sales of Woodstock Bourbon and Cola over the key summer sales period. consumers must be provided with a compelling reason to make repeat purchases in-store over a six-week period. The brief from Independent Liquor allowed for plenty of creative freedom, only stipulating that Below the Line NZ needed to deliver two different breakthrough promotional prize ideas for the campaign. The target market was ‘tough working men’ aged 24 to 45 years. Their key drinking occasions were after work, weekend parties and barbecues. The campaign would take place nationally across a range of New Zealand liquor outlets throughout December 2013 and January 2014. The Below the Line NZ research team started by gathering insights into how bourbon-loving ‘tough working men’ like to spend their spare time, especially when it’s with a can of Woody in their hand! Market research revealed that the Woody man’s favourite pastime was sharing a Woodstock Bourbon and Cola with his mates while enjoying a barbecue and playing pool. appealed to the liquor store owners enough to command and dominate promotional floor space over other brands. It couldn’t be just another promotion. Below the Line NZ went back to Woodstock’s southern American roots to uncover the idea of a smoker/grill-style barbecue. The ‘Man Kitchen’ concept was born. And while pool tables were not a new concept, research showed none had been given away in-store for more than 10 years. Finally, recent introduction of new New Zealand liquor laws meant the summer promotion could only be communicated in-store – there was no opportunity to build profile through other media. This meant in-store support was crucial to achieve maximum visibility of the promotion, leading to a strategic investment in sizable displays across the country. Once Below the Line NZ had created the specific concept designs, the next challenge was to source the branded products and organise delivery of more than 450 oversized items within a tight timeframe. The first final promotional product item was a 2.1-metre-long Woodstock pool table. The playing surface was dyed to match Woodstock brand PMS colours and the logo applied by sublimation print rather than oriented to ensure longevity. Each pool table came with an accessory pack, containing pool cues, balls and chalk. The second final product was a customised horizontal ‘Man Kitchen’, including a barbecue charcoal grill and smoker. The branding was applied as a secondary process on arrival in New Zealand. A metal badge was used to ensure the branding would not be damaged by the significant heat produced by the product. By working closely with Independent Liquor, Below the Line NZ identified a potential issue: a large number of the liquor outlets around the country were manned by just one person and any large promotional displays would need to be assembled solo. Usually both items would be shipped in containers as flat packs. With the requirements for easy assembly, a new packaging approach was successfully investigated and executed – both items were shipped partially assembled. Finally, competition entry forms were provided to each outlet. 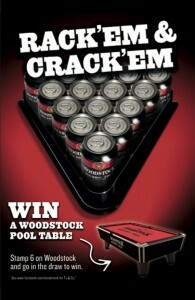 Customers who bought a 24-pack of Woodstock Bourbon and Cola were eligible to enter their details for the prize draw. Multiple buys qualified for multiple entries. These were drawn at random at the end of the campaign and competition winners simply collected their pool table and Woody ‘Man Kitchen’ from their local liquor store. at the 2014 Australasian Promotional Products Association (APPA) Awards for Promotional Excellence, the promotion was awarded Gold in the ‘Consumer Gift/Gift with Purchase’ category and won the overall Platinum award.